I haven't been in a beta test since the original Homeworld. That was nearly twenty years ago. Google has ruined this record-setting dry spell by inviting me to Project Stream. Project Stream isn't about broadcasting games on Twitch with a forced personality from your fighter pilot gaming chair. 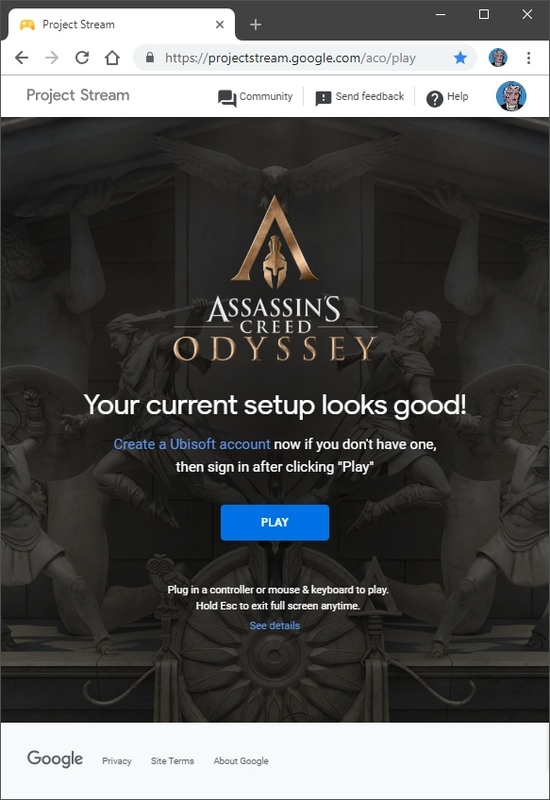 It's the other kind of game streaming, where you play a game (in this case Assassin's Creed Odyssey) that's running on a remote computer streaming the video + audio to your computer. Before we go further, you should know that I am wary of game streaming. Very wary. Maybe even dubious. My main technical concern is input delay. You push a button on your controller. The signal goes through the entire internet, stopping twice at conservative news sites. Eventually the signal reaches the remote computer. It tells your character to do a video game action, like shoot a guy or pay respects. Then the result travels across the entire internet again on its way back to your screen. In video games, I have been told that interaction is fairly important. Introducing more stops between your input and the game seems like a bad idea. On the other hand, the computer I currently use for PC reviews is ancient. My video card is an NVIDIA 660ti. They're about to release the 2080ti. That means I'm 1420tis behind. Shameful. I am fortunate enough to have a fairly reliable 100mbps fiber internet connection, though, so this is the only way I'm able to check out Odyssey at its highest settings. At this point the game goes fullscreen and you're in the full Assassin's Creed Odyssey. Sort of. The video settings are gutted/hidden, and you can only exit by holding the Escape key on your keyboard for several seconds. Aside from that, though, you're just playing a dang game. The game looks sharp and runs smoothly, appearing to display at my monitor's native 1080p. You might expect weird graphical artifacts to pop up when things get complicated. That doesn't happen. Instead, the entire game seems to dynamically drop to 720p without hitching. This is most noticeable when you're running through areas with lots of vegetation. Did I mention that about two thirds of Assassin's Creed Odyssey is spent running through vegetation? The control delay isn't too bad. It feels like playing a console game on a tv with moderate input lag. You'll notice it. It won't affect much in a third person melee-centric game. A first person shooter would be miserable. Occasionally the game simply freezes for a few seconds, then kicks me out to the login menu. Sometimes when I click play I resume exactly where I left off. Sometimes it brings me to the main menu. That's the only real issue I've had, and it popped up around ten times in my Odyssey playthrough. So Project Stream works pretty well, all things considered. I wish it didn't. We're drifting away from physical media and losing control over the things we enjoy. Sure, Google's service would be a great way to check out a game with very little investment. The problem is, if it and similar services from Microsoft and Sony become the norm it will absolutely be at the expense of those who care about preservation and want to own the entertainment they love. A game should always be available as a physical thing you can own, detached from any subscription or service, far from the reaches of companies that would strip out content because of licensing issues or business decisions. I don't care if they come on discs, or cartridges, or... actually I do care. Cartridges are rad. As long as I'm on my soapbox all media should come on cartridges. Make them the size of Scrabble tiles, little magnetic blocks that can be slapped on computers/consoles/etc. and read with some form of near field technology. They should be called Farrell Devices.